Buildings around the world will turn scarlet on Nov. 28 as part of Red Wednesday, an initiative launched to show solidarity with persecuted Christians. The initiative was launched by Aid to the Church in Need, a pontifical foundation, and will be supported this year by Christian Solidarity Worldwide, an organization that works to secure religious freedom for all, Forbes reports. 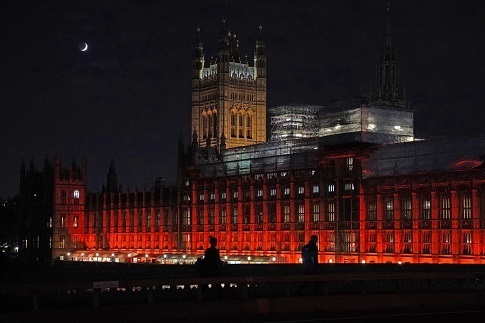 In past years, London's Westminster Palace and Westminster Abbey, as well as the Colosseum in Rome, have been lit red in recognition of the day. The Colosseum holds special significance in the history of Christian persecution, as many suffered there prior to the legalization of Christianity in the Roman Empire. In the United States, several buildings will be lit this year, including the Basilica of the Immaculate Heart of Mary in Washington, D.C. and the Cathedral Basilica of Saints Peter and Paul in Philadelphia. A study by the University of Notre Dame's Center for Ethics and Culture, the Religious Freedom Institute and Georgetown University's Religious Freedom Research Project concluded that Christianity is "the most widely targeted religious community, suffering terrible persecution globally." Aid to the Church in Need's 2018 "Religious Freedom in the World" report found violations of religious freedom increased in a number of African, Middle Eastern, and Asian countries over the past year, including in Saudi Arabia, India, China, and Indonesia. The U.S. Commission on International Religious Freedom placed 16 countries on its "Countries of Particular Concern" list in its 2018 report. China and Saudi Arabia were both included on that list. Earlier this year, the U.S. State Department hosted the first-ever Ministerial to Advance Religious Freedom, which brought together delegates from about 80 countries and representatives from civil society organizations from around the world, as well as victims of religious persecution who offered to share their stories. This entry was posted in Issues and tagged Religion, Religious Freedom. Bookmark the permalink.